One of the most priceless moments as a best friend is being able to support your soul sister as she walks down the isle on her big day. In other words, being a bridesmaid for your bestie. Not only will you be next to her with all your heart and soul as she begins a new chapter in her life, but you’ll also be living what you both have dreamed of while growing up. To help you focus on cherishing the moment instead of stressing out about your appearance, here are our favorite bridesmaid hairstyles. 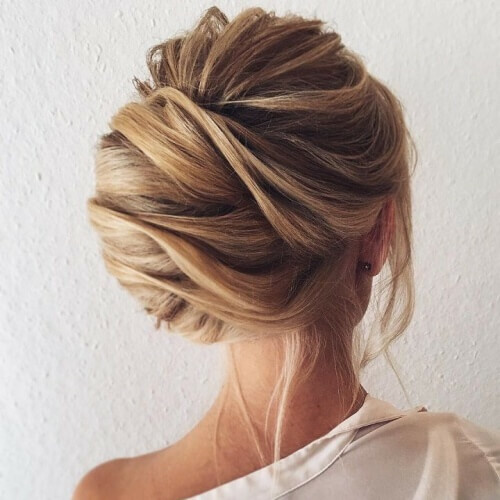 Among elegant hairstyles, we can easily state that the chignon has a unique charm. 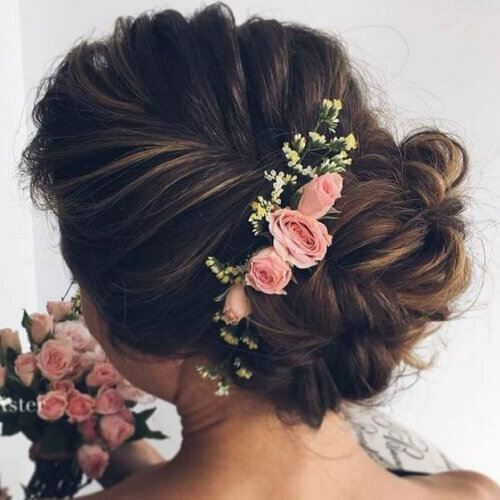 We have already talked about tens of ways you can rock this French hairdo, but we couldn’t have missed the entry on our bridesmaid hairstyle list. If you truly want your hairstyle to be memorable for both yourself and the bride, you can consider a complex fashion. In other words, you can mix different braiding techniques, all in a spectacular updo that surely won’t be overlooked. Regardless if you’re attending a black tie event, festival, prom or wedding, you can never go wrong with this half up half down hairstyle. It’s wonderfully simple to achieve, requiring only a loose braid in a tiara-like fashion across the back of your head. As we go through our bridesmaid hairstyles, you will undoubtedly notice a pattern with braids. It’s easy to see that they’re a sign of refinement, no matter what technique you choose. A large and loose fishtail braid swept to the side is always appropriate. Channel your inner retro diva with this hairstyle for bridesmaids. What we truly appreciate about it is the simplicity, through the soft vintage waves. This is also an excellent hairstyle if you are taking part in a themed wedding. 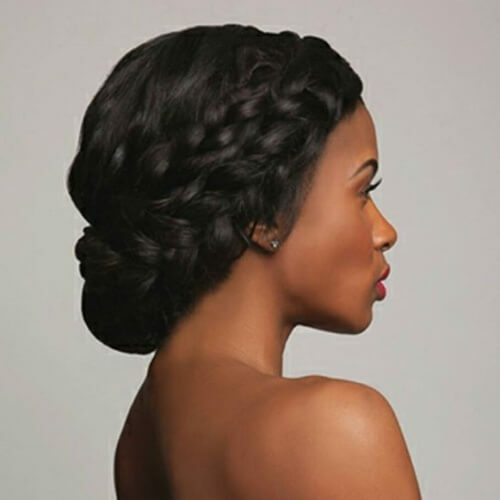 It doesn’t matter what natural hair texture you have – a fully braided crown will always look splendid on you. 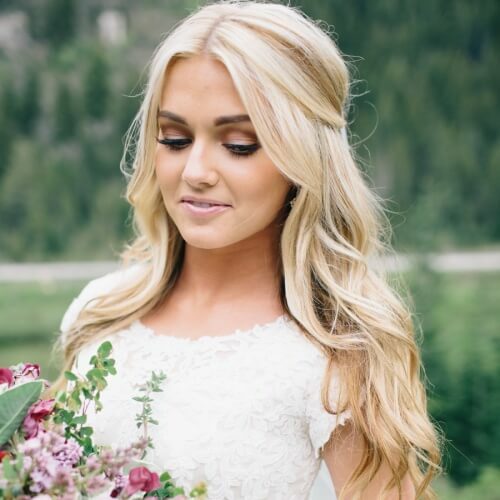 This is one of the most popular bridesmaid hairstyles out there, and all for obvious reasons. Make sure the braids are tight enough so they won’t unravel mid-event. 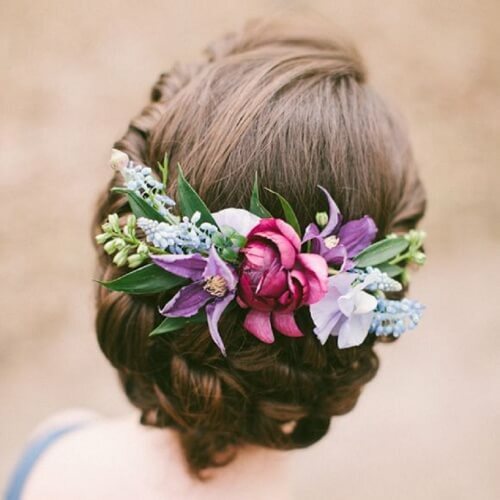 Any flower girl deserves a few flowers in her hair too, right? 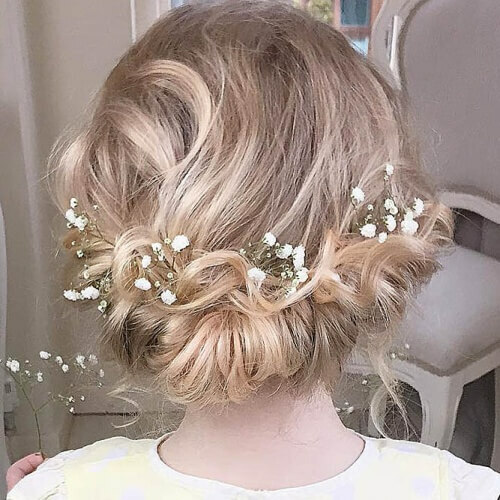 This adorable hairstyle is a terrific choice for young bridesmaids who want to feel like princesses throughout a wedding. You would be surprised to find out how small details can go a long way. Another timeless hairstyle that will provide a note of sophistication to your bridesmaid attire is this vintage updo. Inspired by retro fashion, it is defined by soft curls styled gently to the side. 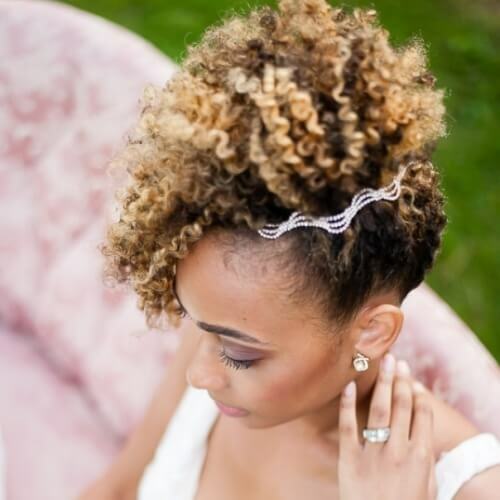 This radiant hairstyle can be sported by bridesmaids and brides alike. If you have long hair and you’re into half up half down hairstyles, this just might be the choice for you. 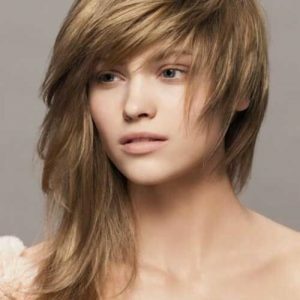 While it’s not a complicated style, it is a ravishing option for women with long and flowing locks. Stock up on those bobby pins! We can’t stress enough how irreplaceable messy buns are in a women’s life. They are, without a doubt, one of the most versatile hairstyles we have access to. While you can rock one for a stroll in the park, you can simply take it to the next level as a bridesmaid hairstyle. If you’re lucky enough to have significantly long hair, a whole new world of styling opportunities opens up for you. 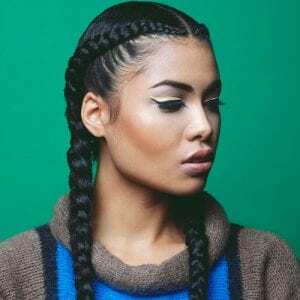 Not only can you play around with a multitude of half up hairstyles, but you can also incorporate various braids into it, from twisted to pull-through alternatives. Often, you don’t have to go over the top with your hairstyle to make it remarkable. Sometimes, all you have to do is have the right accessory to complete the look. 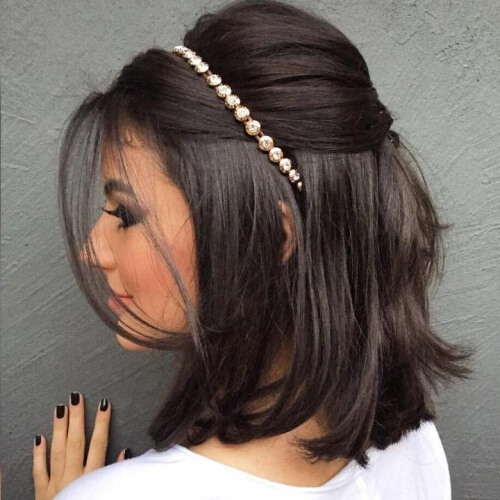 In this example, you can see how a half up hairstyle for shoulder-length hair comes to life with a picture-perfect headband. 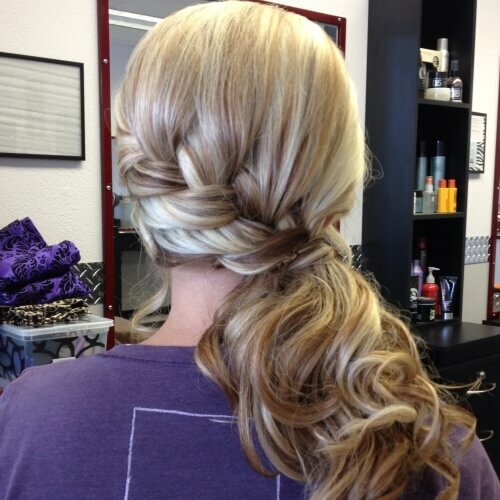 To prove our point, here is another one of the bridesmaid hairstyles that shines through simplicity. While we don’t recommend a casual ponytail for a wedding, you can add a chic touch to yours by twisting a few strands around the hair tie. Updos will always be among the most beloved bridesmaid hairstyles of all. In addition to the fact that they work amazingly well with fancy dresses, they represent a special hairstyle category. To put it otherwise, you’ll be adorning a hairstyle that you wouldn’t normally wear every day. At a glance, having short hair may seem to be a challenge when researching impressive bridesmaid hairstyles. However, even the shortest of locks can be smartly styled to honor such an unforgettable event. 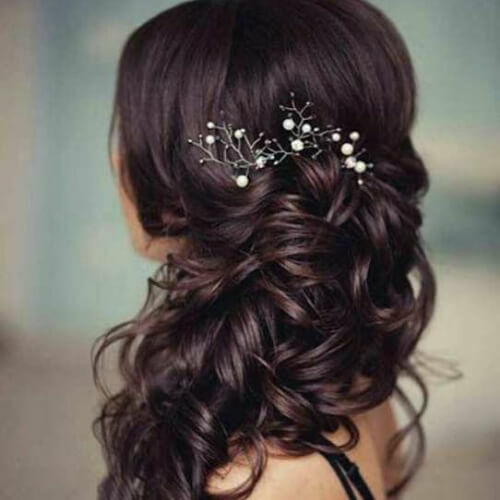 You can use a hair pin to the side for a glamorous effect. Want to keep your hair out of your face throughout the event? Consider swept back bridesmaid hairstyles. A foolproof and fabulous way to do so is by creating a crown braid. Follow the line of a normal headband and braid your way from one side to the other. Here’s another cute idea for the littlest of bridesmaids. 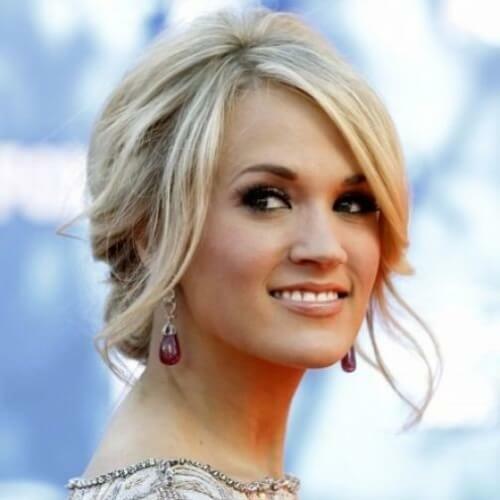 This hairstyle is commonly referred to as the “tuck and roll”, owing to the way it’s obtained. The small white flowers also have a huge impact on the sweet allure of the final look. If we’ve said it once, we’ve said it a thousand times – you can never go wrong with a side swept hairstyle for formal events. 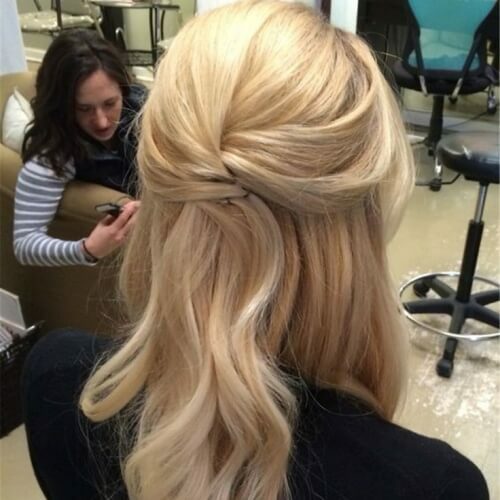 No matter if you opt for a side ponytail or braid, the outcome will be just as breathtaking. Here’s how a loose, side fishtail braid would look. What if your hair isn’t too short, but not too long either? Any medium-length hair looks marvelous with a half up hairstyle. You can go for the popular boho braid, or get creative with your own ideas. Whatever you choose, don’t shy away from loose strands. If you’re one of the lucky women with naturally thick hair, almost any hairstyle will look fantastic on you. Nevertheless, there are some that accentuate the natural fullness of your hair even more. Tie yours half up and tease your hair a bit for a glam effect. 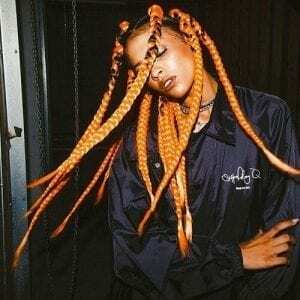 Torn between buns and braids? Make the most of both worlds by combining the two styling techniques into one of the prettiest bridesmaid hairstyles around. Start by sweeping your hair in a large bun, and continue by wrapping two braids around it. Less often proves to be more, especially when it comes to formal hairstyles. A jaw-dropping hairstyle for a bridesmaid can be as easy as a low bun at the back of your neck. We recommend leaving a few locks loose in the front. 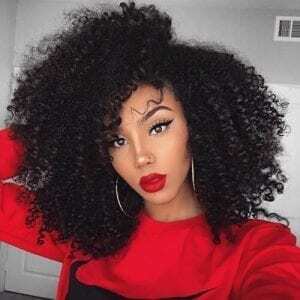 After growing out your natural, afro-textured hair, you will most likely want to experiment with hairstyles that bring out the best in it. To show off your curls in a respectable manner, think about recreating the hairstyle in the photo above. High buns aren’t the only ones that look absolutely magnificent when styled messily. The same goes for low buns, or any kind of chignons. After you tie the bun at your nape, start teasing here and there to get that effortlessly stylish look. We always encourage our readers to use their imagination when contemplating hairstyles. 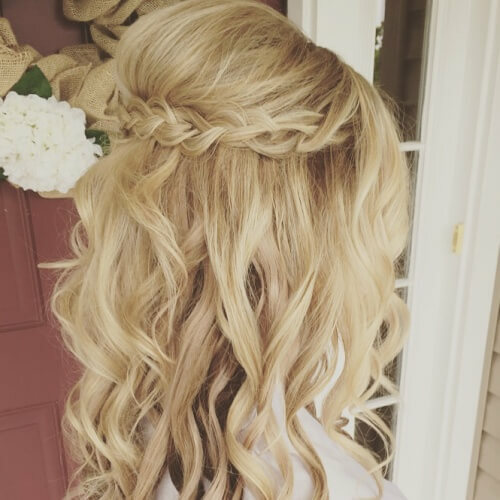 It’s no different for successful bridesmaid hairstyles, which can leave an astounding impression when conceived with an “out-of-the-box” approach. 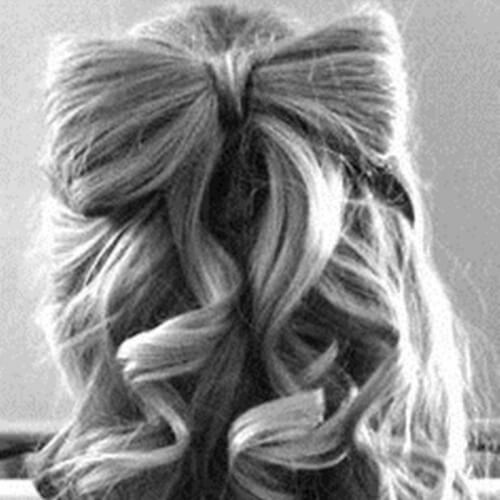 Take this half up bow, for example. If you’re the chief bridesmaid, you will most likely be right by the bride’s side throughout the wedding. This means that your attire and beauty choices for the event should be appropriate, not taking away the bride’s shine. The loose and low hairstyle above is a perfect choice. 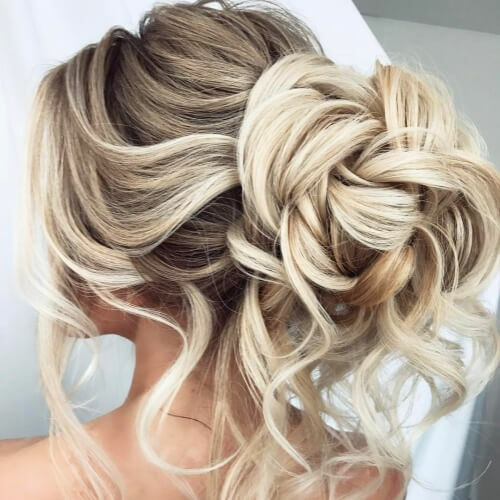 No matter if you have shorter hair or simply lack the necessary time for a complex updo, this hairstyle should inspire you. All it requires is knowing how to create a simple, three strand braid. Use a few locks in the front, braid to the side and pin in place. Voila! Planning on attending an outdoor wedding? How about one with a bohemian theme? 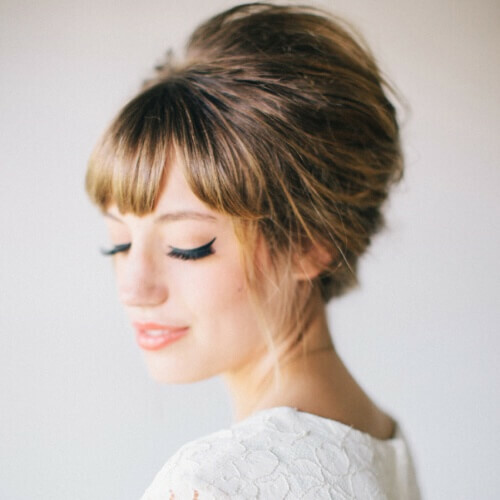 One of the cutest bridesmaid hairstyles you could go for is directly inspired by this vibe. 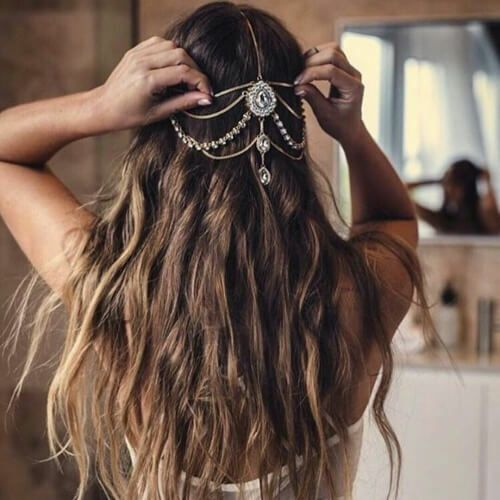 Keep your hair down and shop for a boho hair piece. Just like the simple side braid we spoke about earlier, this hairstyle is alluring while being low-maintenance. You can take a few strands and pin them above one ear, revealing one side of your face. Elegance made easy! Struggling with shoulder-length locks? You can enjoy a delightful bridesmaid hairstyle without much effort at all. 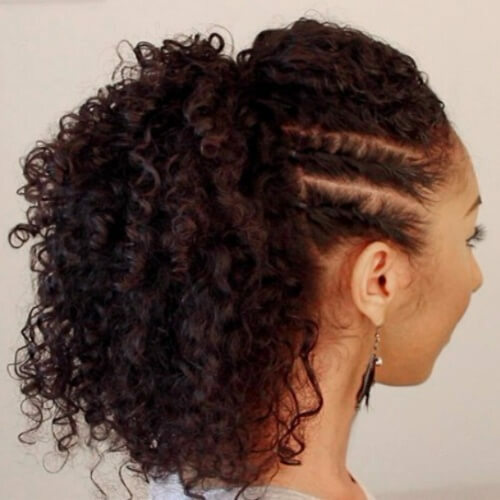 This loose updo idea works especially well for women with naturally wavy or curly hair. However, you can curl yours a bit for a similar effect. 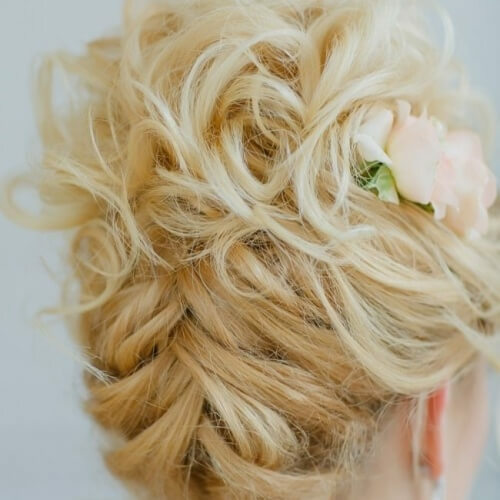 We’ve talked all about half up hairstyles, but what about the half braided bridesmaid hairstyles you can try out? For a truly original take on your appearance, you can unravel your braid halfway down. If you go for this approach, we recommend sweeping it all to the side. 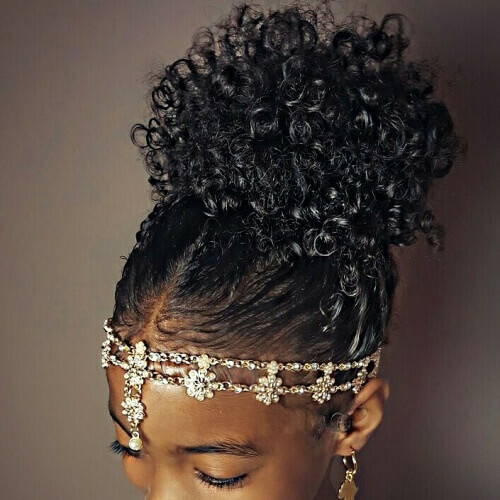 Here’s another gorgeous idea for our ladies with afro-textured curls. Provided your hair is just about mid-length, you can pin it all up in a stunning faux hawk. To top off the look, use accessories to outline the hairstyle. Obtaining this flawless look will require only a few minutes. 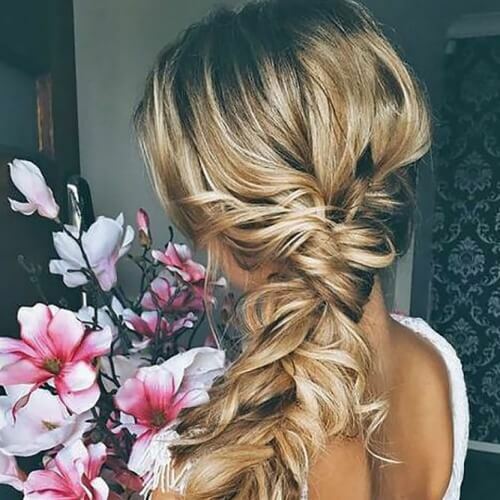 As long as your hair is long and a bit wavy, you can take a strand on each side and just pin them to the back. Make sure you add some hairspray and you’re good to go! When exploring bridesmaid hairstyles, you will most likely have the rest of your outfit in mind throughout the process. If the dress you are planning to wear is strapless, you can experiment with a loose updo with braids to highlight your collar bone and bare shoulders. Instead of opting for just one side braid, think about going for two! This is an enchanting idea for ladies who always strive to add a personal and fun touch to their look. Moreover, the peach flower accessories can also be kept in mind. 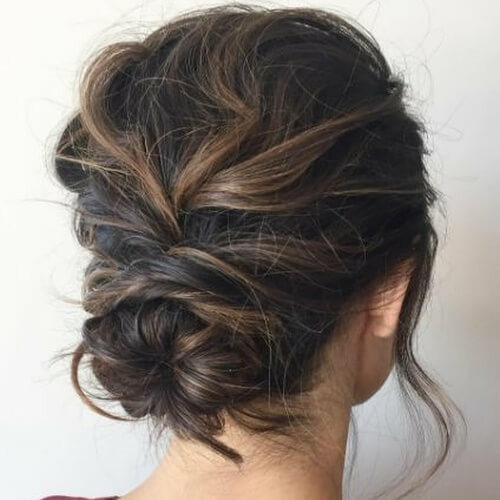 After you have spent time and effort creating the low bun of your dreams, you can start thinking about ways to spice it up. 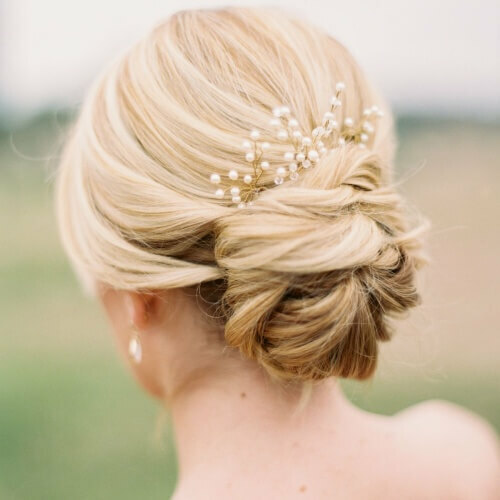 While we don’t encourage you to get too flashy with your bridesmaid hairstyles, you can add a graceful pearl accessory. Is your BFF’s wedding in the middle of a scorching summer day? Fight the heat in the most stylish way possible with an adequate hairstyle. Loose and messy updos are a must, just like the one presented in the photo above. Want to stand out from the crowd? Take any one of the bridesmaid hairstyles you are considering and see how it would look styled to the side. We’ve shown examples with braids and ponytails, and here is how a side bun would look like. 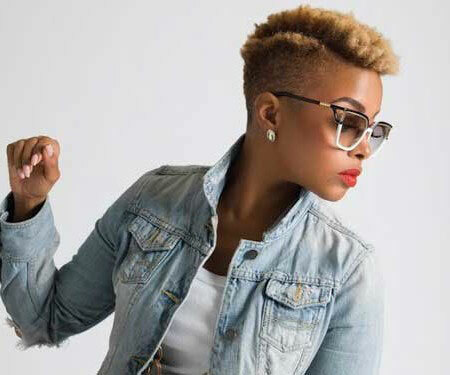 Where our ladies with pixie cuts at? 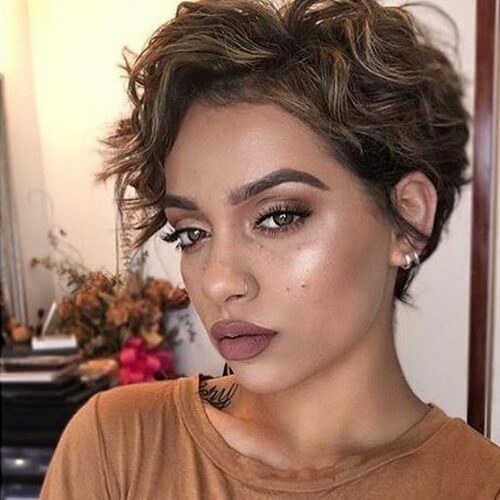 We are head over heels in love with this haircut, but we’re well aware that it’s not the easiest to style. If you are going to be a bridesmaid, you should make it wavy and toss it to your favorite side. One of our favorite parts about bridesmaid hairstyles is that they give us the same excitement as dressing up when we were kids. For hairstyles, you can take your long hair and curl it for a fairytale appearance. Not only is this a jaw-dropping hairstyle for any bridesmaid, but it’s also more creative than you think. It actually works by pinning your hair under so it appears as though you have a bob haircut. If this isn’t gorgeously genius, we don’t know what is. If you have ombre hair, this is one of the most flattering bridesmaid hairstyles you can try out. The side braid will help accentuate the two distinct colors in your hair, while the ponytail ending will make the all around hairstyle playful and dynamic. The French twist is one of the most refined updos available, but what happens when you give it a personal twist? 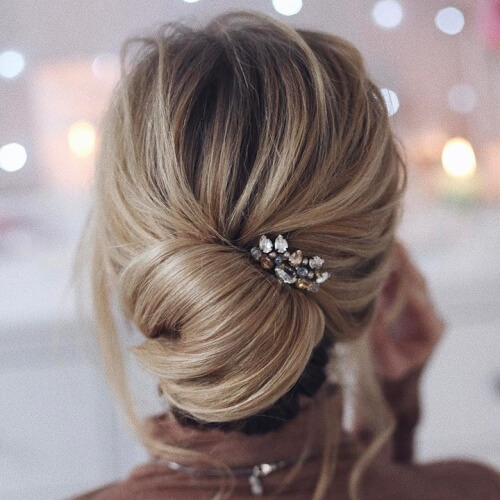 You can make an unforgettable appearance at your friend’s wedding by styling your French twist to the side. 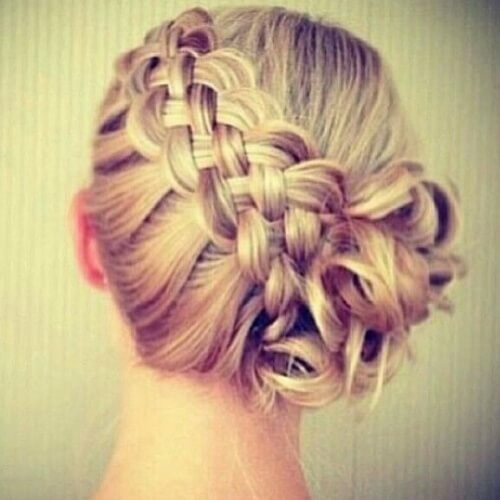 The complex braiding involved in this diagonal plait makes the hairstyle all the more memorable. 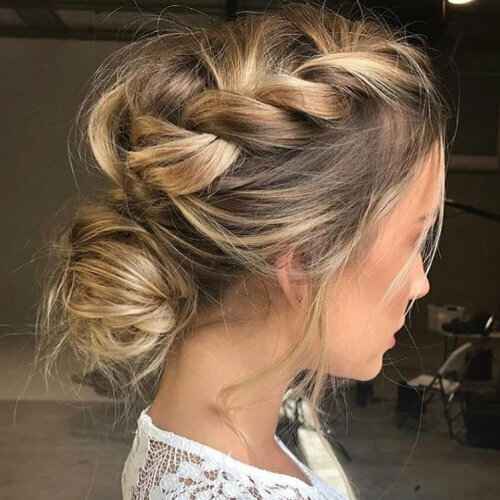 It’s an exceptional way of keeping your hair up throughout the wedding, especially if it takes place during a hot summer day. 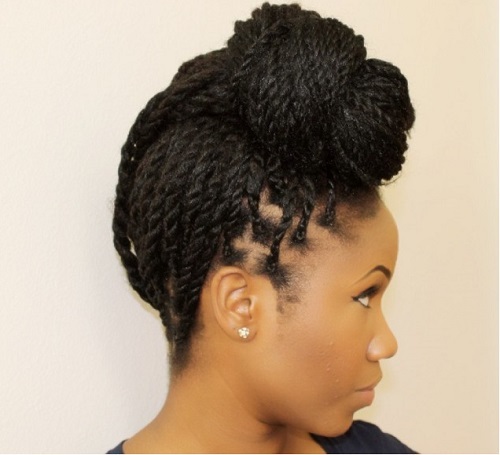 Go against the grain with a reverse braided hairstyle! As you can probably guess from the name, a reverse braid is created in exactly the opposite direction as a standard one. In other words, start from your nape and work your way into a charming updo. With a brilliant haircut like this one, you won’t have to stress about any maintenance for your bridesmaid hairstyle. 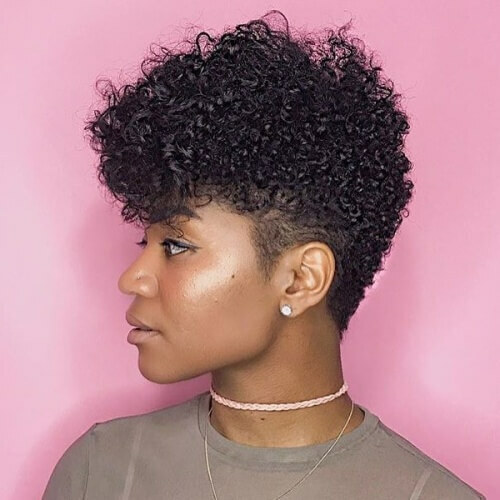 The tapered technique focuses the attention on the curly top, adding volume galore. Just add a bit of product before you leave for the venue. Natural curls will always look outstanding when tied in a large puff. However, if you want to make the look even more heartwarming, do some research on sparkling accessories. This crystal headband, for instance, makes the hairstyle even more admirable. What about our divas with bangs? We haven’t left you out, and we have a dazzling idea to inspire you for your bridesmaid hairstyle. Make your hairdo stand out through impeccable volume, achieved by teasing with hairspray and the proper updo styling. Sometimes you don’t even need ponytails or braids for a sensational side swept hairstyle. What we do recommend is to loosely curl your hair if it’s naturally straight. After that, bring it all to the side and spray in place. Last but definitely not least, this updo is the most colorful choice on our list. We encourage you to consider this outgoing option if the wedding is outdoors. Even more so, you can speak with the other bridesmaids to get matching flower updos for some superb photos and memories. 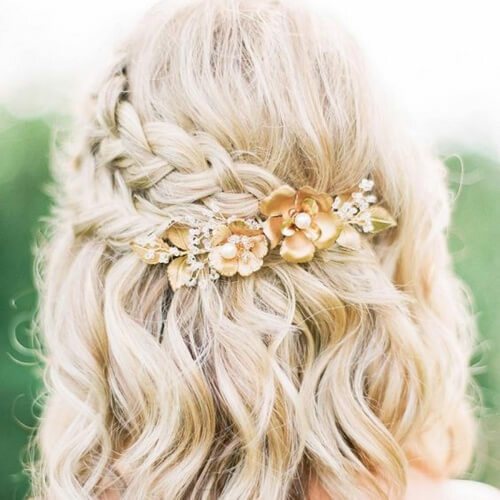 To conclude, these bridesmaid hairstyles are sure to inspire you for stylishly supporting your best friend on her wedding day. We know how hectic things can get before an important wedding, so our main aim with this article is to lend a helping hand in at least one aspect. This way, you can check off a task on your to-do list and concentrate on being there for the bride. How was the experience for you? 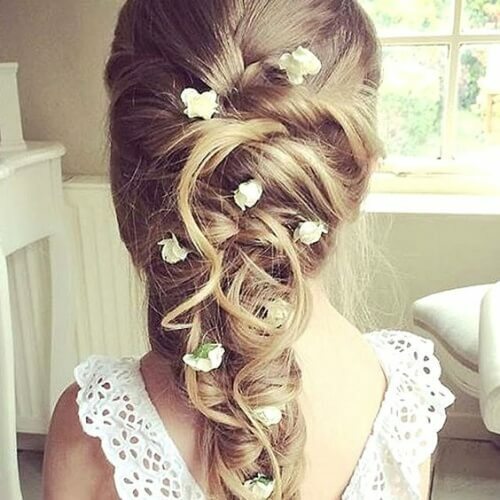 Tell us all about your favorite hairstyles for bridesmaids in the comments section!